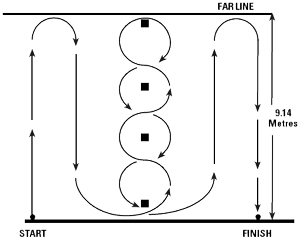 This Illinois Agility test assesses an applicants speed and athletic agility. The test is an electronically timed test and requires maximum speed and effort from applicants to negotiate several traffic cones. Prior to the test applicants must warm up with a light jog or power walk, followed by stretching exercises concentrating on lower limbs and back. The test starts with the applicant laying on their stomach (head on the start line), hands by their shoulders, arms flat on the ground and both legs extended behind the line. On the 'start' command, the applicant gets to their feet as quickly as possible and sprints to the top of the course and touches the line with one foot before returning to the first cone located at the bottom end of the course. The applicant then weaves in and out of the row of cones and back again towards the bottom of the course. The applicant then finally sprints once more to the line at the top of the course, touching with their foot and sprinting back to the finish line through the timing gate. Applicants who fail to touch a line, miss, knock or touch a cone will be stopped from completing the test. Applicants must complete the test in 20 seconds or less and are allowed two (2) attempts only. The course measures 9.14m in length and 4.6m in width. You should aim to get to you feet as quickly as possible to reduce time lost in getting to your feet. Practice this movement. Run a quickly as you can between straight points, saving time for the weaving element. This is a dynamic test and takes less than 20 seconds, so don't conserve energy. Give it everything you have got from start to finish. Make sure you touch or put your foot over the lines at the top end of the course and stay well clear of the cones when weaving. Don't slow down before the end timing gates, continue to sprint through the gates.